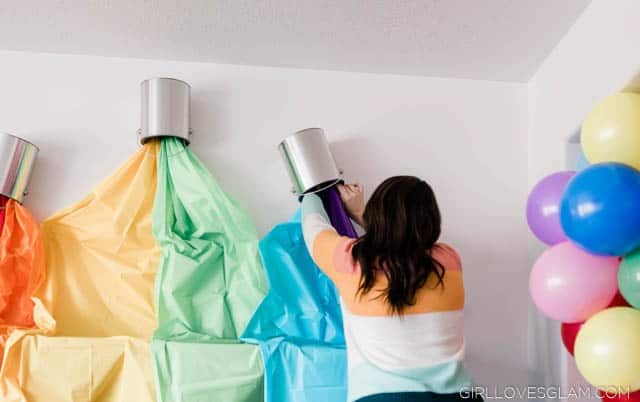 We obviously needed to introduce a lot of color to our house for this party, and what better way to do that than by creating a paint bucket wall? Empty paint buckets- You can buy these at Home Depot! I searched all over the place and this was the cheapest place to find them. 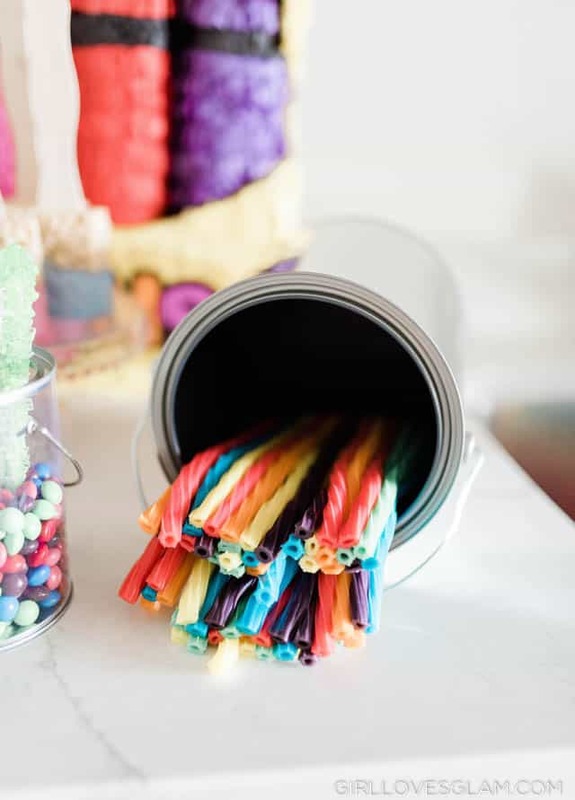 Rectangle table cloths- You will want to buy them in all of the rainbow colors, or in your party colors. I found mine in the party supply section of Hobby Lobby for only 99 cents. 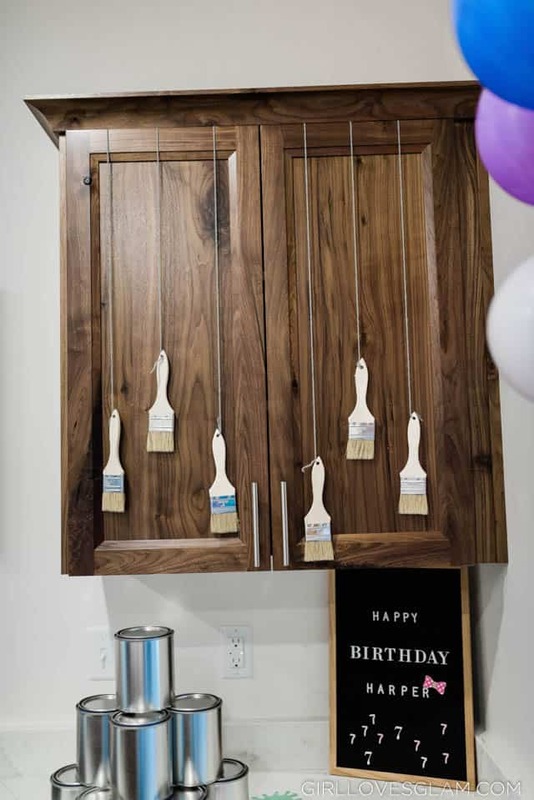 Start by hanging up your empty paint buckets where you want them. 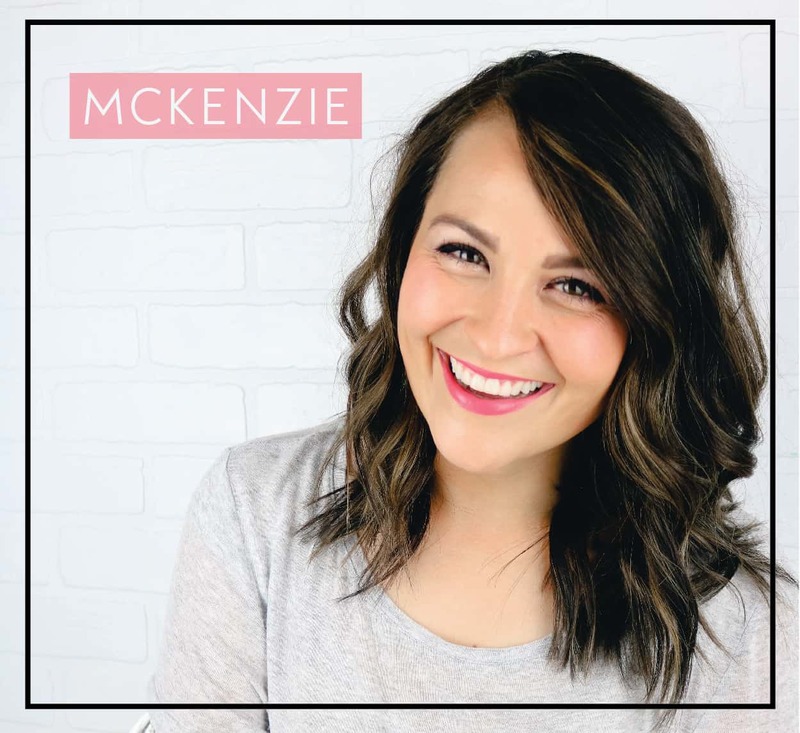 You will stick 1-2 of the Command strips on the back of them and stick them to the wall. 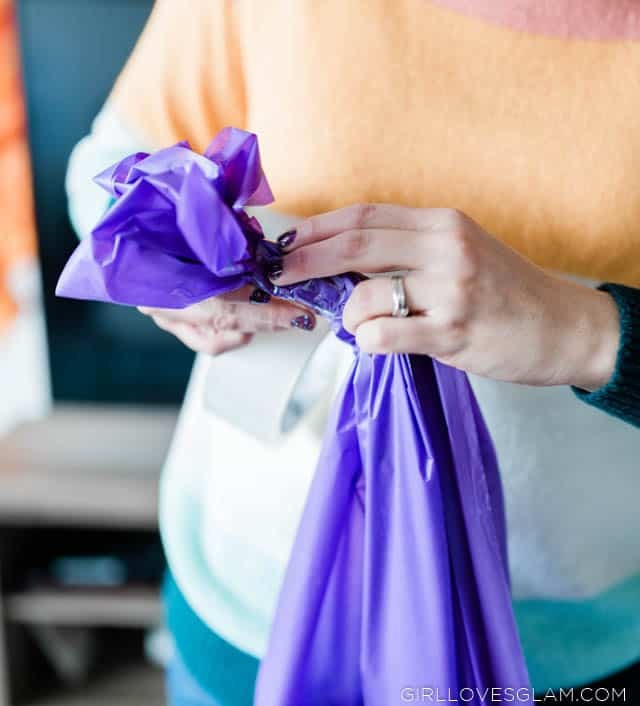 Wrap the packing tape around the end of your table cloth to bunch it all together. 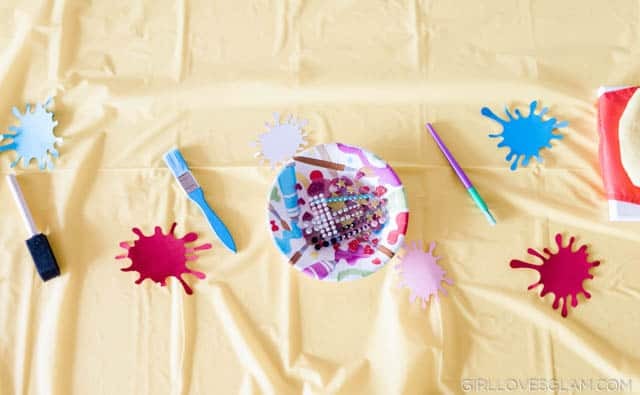 Stuff the end of the table cloth in your paint bucket and tape it on the inside. 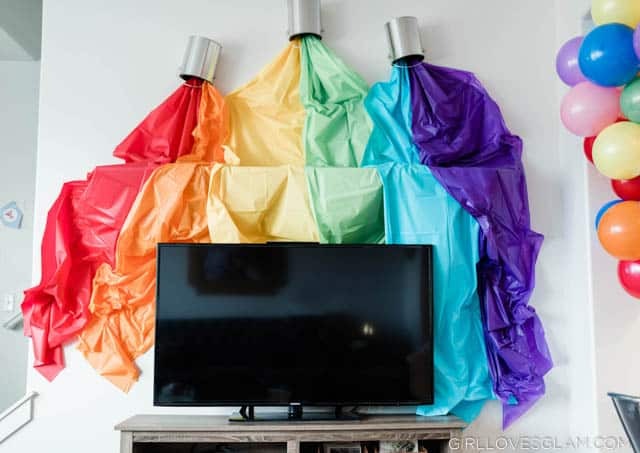 Tape the table cloth onto the wall so that it lays just the way you want it to. 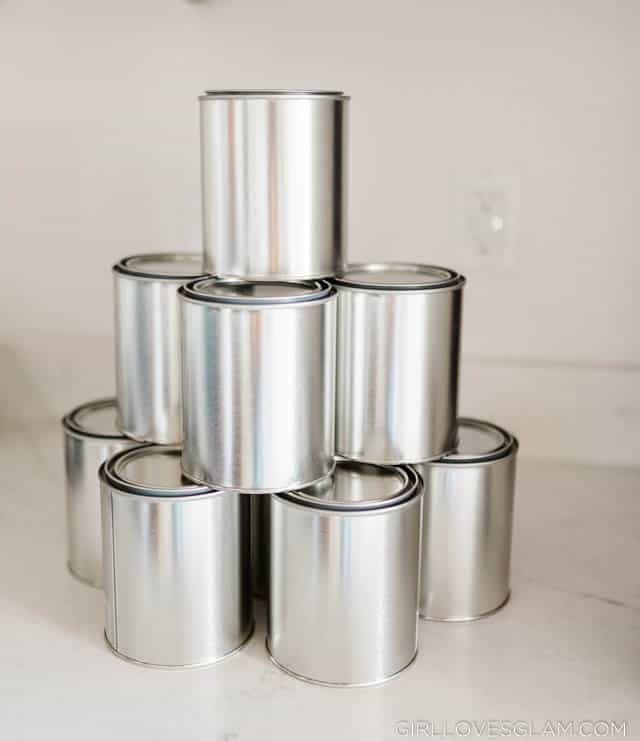 Repeat these steps until you have all of your paint spilling out of the buckets! It makes an awesome background, especially if you don’t have a giant TV in the way. But this is our real life and that’s just how our house is. But I still just really love how this wall turned out! It made a really big statement, without being a huge project. Speaking of making a big statement, our balloon arch was just the right way to brighten up our space and welcome our guests! 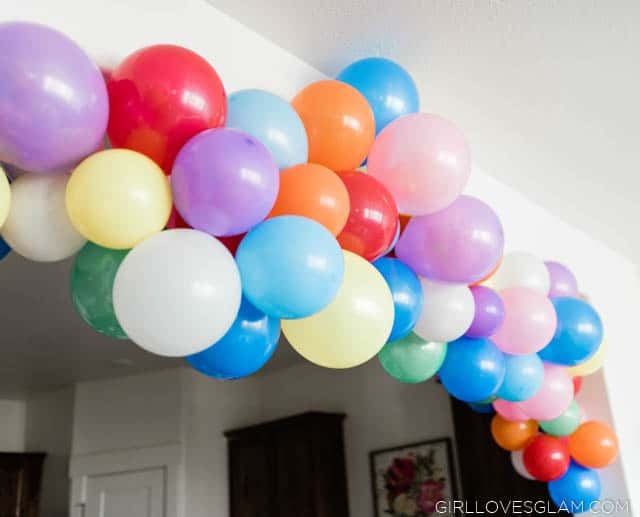 I shared a full tutorial of how to make a balloon arch, so head on over there to get those detailed instructions. Since our party was being held in our kitchen mostly, I wanted to come up with a way to decorate our kitchen cabinets as well. 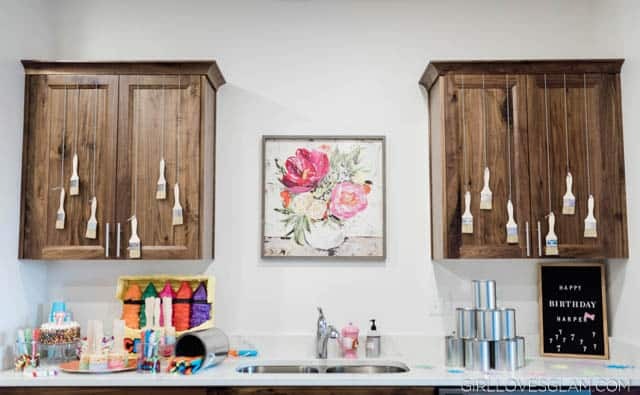 We ended up buying a big box of inexpensive paint brushes and drilling holes in the end of them so we could hang them up on our cabinets. 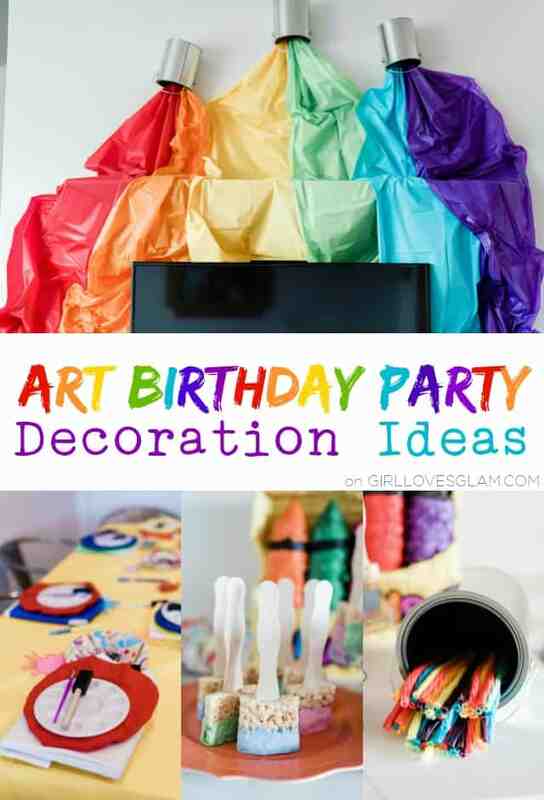 I love how they all tie in with our theme and they can totally be used in the future for random paint projects as well. 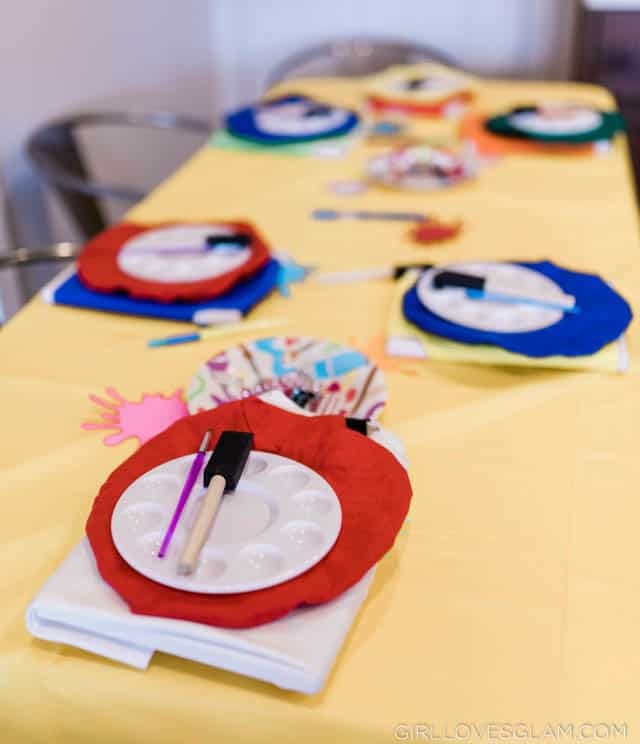 I will be sharing more about what activities we did at the party, but each girl got a canvas, an apron, a beret, a painter’s palette, and some paint brushes. 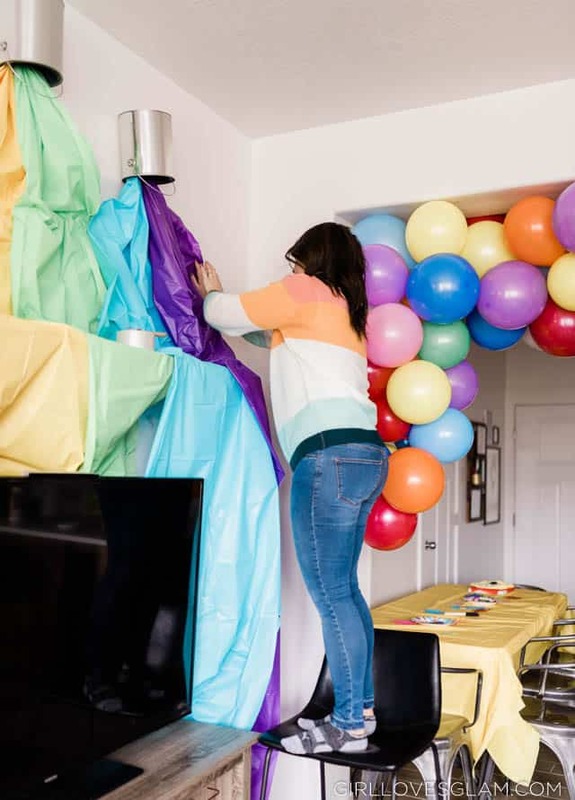 We stacked them all together on each of their places and it was a fun way to have the party decorated before they all arrived. I cut paint splatters out of paper with my Silhouette Cameo to add a little more color to the tables. We also had bowls with art supplies in them that were paint themed. We found all of our paper goods at Hobby Lobby. 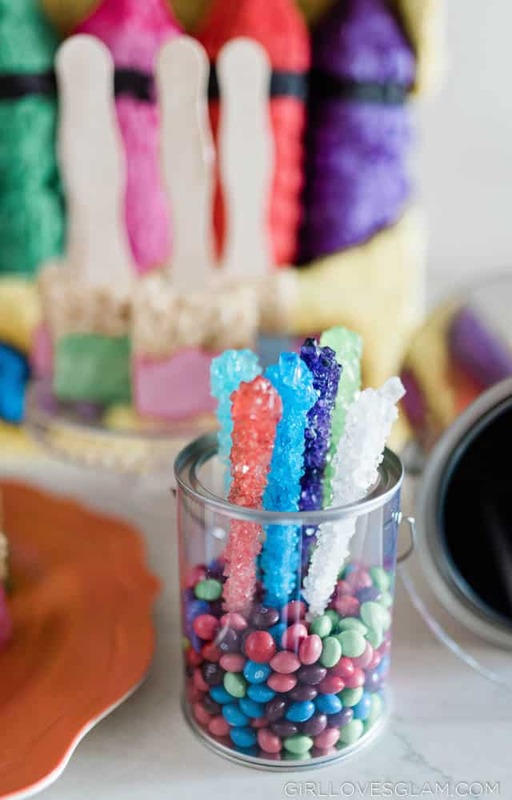 For our treat table, we went for lots of sugar and color! 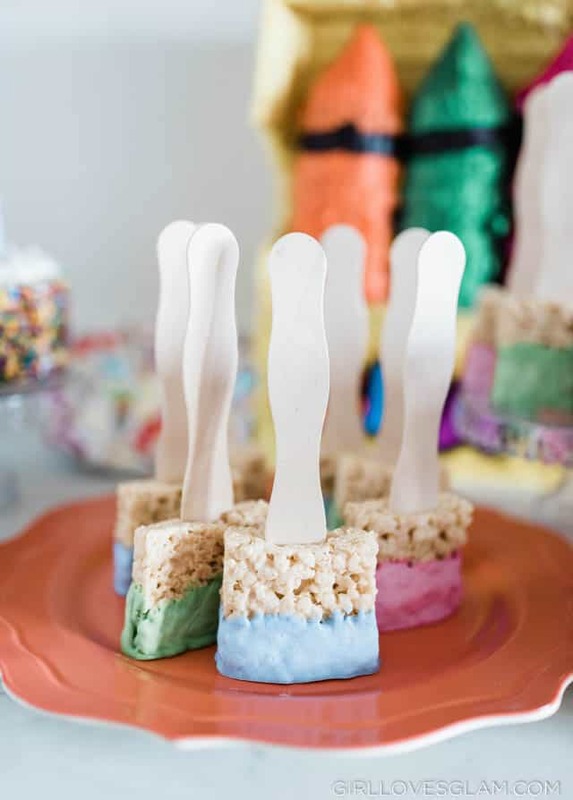 I got small, clear paint jars and filled them up with Skittles and rock candy suckers, we made rice krispie treats that looked like paint sticks, and had colorful licorice spilling out of a paint bucket. I let the girls fill up their own bags with snacks they could munch on while they were crafting at the party. 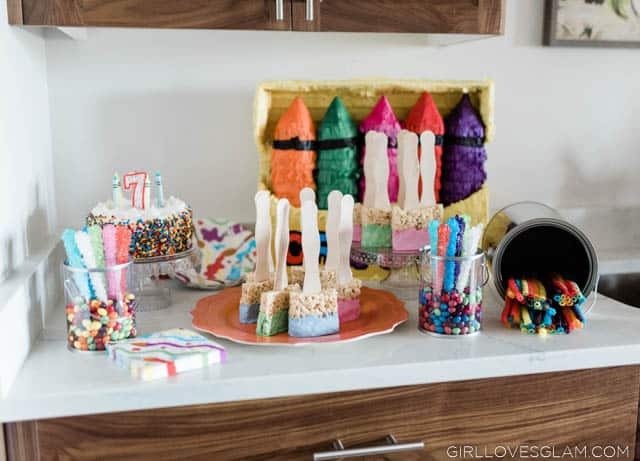 We also used our crayon pinata as a decoration for our food table until it was time to crack it open! To make our paintbrush rice krispies, I actually just bought a package of generic rice treats that were already cut in squares. I knew I wouldn’t have a lot of time to make them and they were only $3 for the box, so I decided to go with the store bought option. I found these curvy wooden sticks in the crafting section of Walmart and I stuck one stick into each rice treat. I melted candy melts in different bowls and put food coloring in them to get different “paint” colors. Then I just dipped each paint stick into the coloring and let them dry. 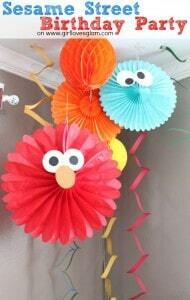 They were a big hit at the party! For the cake, we kept things simple and just went with a generic birthday cake. 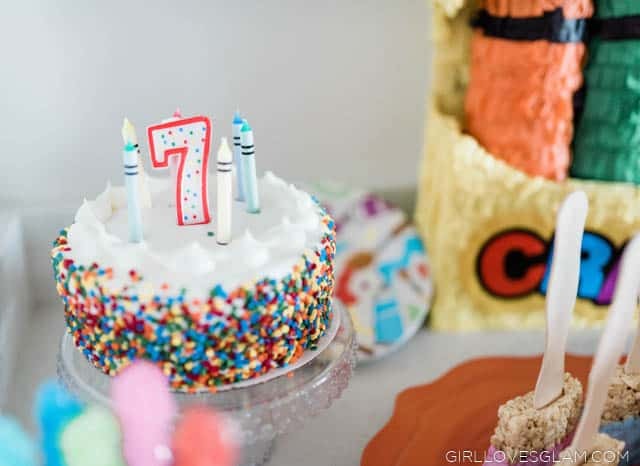 We bought crayon candles to make it stick with our theme more but I have found that if you can just choose a few things that you can really step back on with a birthday party (like buying a more simple cake), you can save yourself a lot of money and save yourself some sanity! Our counter looked great for the party and it didn’t take a lot of effort to put it together. 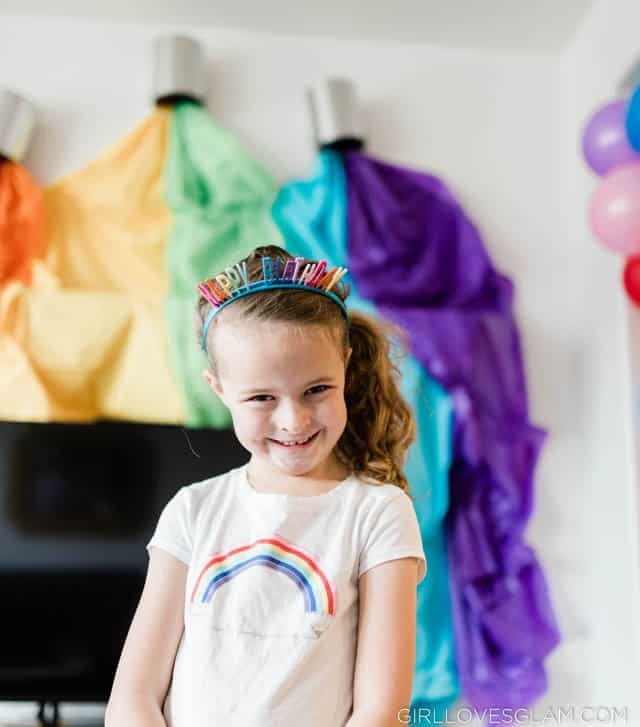 Birthday parties don’t have to be completely overboard with the decorations to make a big statement! Each girl was sent off with her own paint can full of goodies at the end! 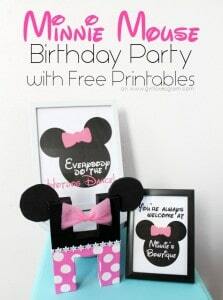 In a perfect world, I would have had these decorated really cute. This is the real world and let’s face it, I didn’t have time! They were full of some really cute things though! I found these paint cans at Home Depot and we put a small paint set in them, a jar of paint, a paint splat sticky hand, and some crayons. They were really excited about all of their treasures! The party was fun and colorful and that’s just what we were going for! 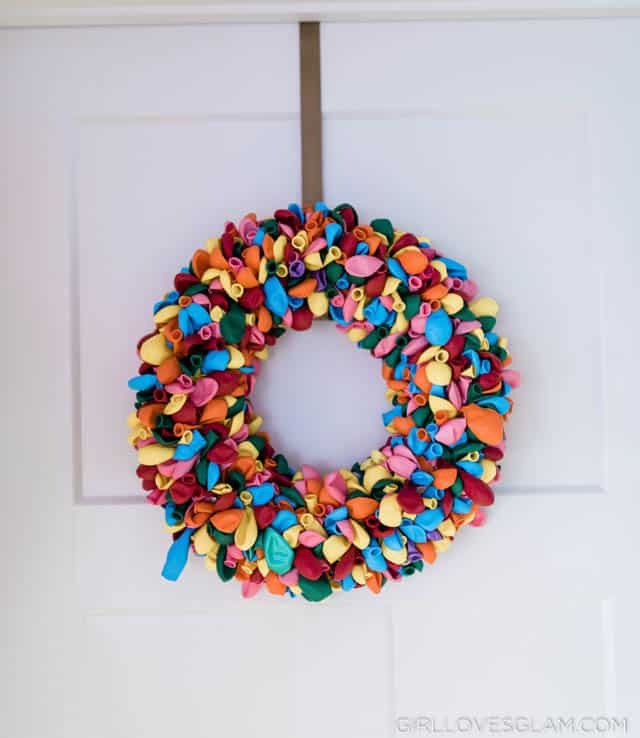 I can’t wait to share our art party activities with you tomorrow! 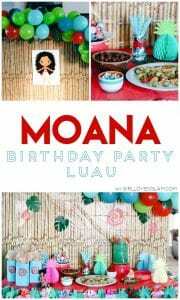 Don’t forget to look at the other birthday parties we have thrown. They have all been so fun!